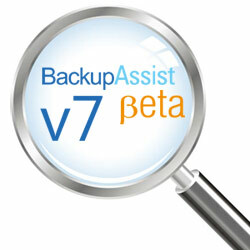 BackupAssist version 7 sees the first iteration of a great new central administration console for remote control access. Administrators can now manage all of their local network installations of BackupAssist through one single web interface hosted by a central nominated BackupAssist installation. All backup jobs and reports from your various installations can be quickly monitored and remote control sessions can be launched to manage a specific installation for changes. In effect, administrators no longer need to remotely log in to a BackupAssist server to manage all of its settings. To begin open the ‘Central Administration Settings’ window from the main application settings pull down menu. Here you will need to create a ‘Remote Administrator’ account with password and choose whether you also require remote console access ( to change settings). Two TCP ports are required for remote access, 8464 and 9120. To keep the setup simple, an option is available to open these up automatically within the Windows firewall if required. This will need to be repeated on each of the BackupAssist installations you wish to control, so I recommend keeping the login details the same to simplify things. Once you’re in you’ll see the current selected computer but also the ability to add any number of other computers/ servers using the relevant connection details. In effect this computer is now your master BackupAssist installation that you can use to quickly gain access to any other computer listed. From this interface you can now view all the job and report details for each machine running BackupAssist, contact support and also gather the licence information. At the top of the screen you can view all of the collated information about the jobs and reports, plus you’ve got the ability to reorder them if you wish. If you want to make any changes to a BackupAssist installation you can select a remote computer and choose ‘Open BackupAssist console’ to open a directly manageable instance of the main BackupAssist console you’re hopefully familiar with. As always, don’t forget that we are still in the beta phase and our Australian friends at developer Cortex are keen for your feedback. Please help them make this the best release it can be by visiting their Beta announcement page and downloading a copy of the latest version! Any news on when v7 will be released? I’m going to need it ASAP for some prohjects I have on otherwise the sales go to veeam. Hi Paul, The Latest news is that Version 7 is due to be released on 13th Feb.